Use of virtual memory is always recomended, even if you have large amount of RAM. If you are running STUX from Live CD, remember that at least 100 MB of RAM are used by system. Virtual memory extends RAM size to the size of phisical RAM + the size of partitions or files mounted as swap partition (swap space). With virtual memory, the memory addressable by operative system is no more limited to RAM size, but is limited to swap space size. You are suggested to use a swap space from 500 MB to 2 GB in size. If you perform tasks that require large amount of memory, like burn CD or DVD, create large ISO images, etc. Existing swap partitions are automatically recognized and mounted at boot time. Existing swap files called 'swapfile' and located in the root directory of any mounted EXT or FAT partition is automatically recognized and mounted at boot time. In section 'Hard Disk', select the partition that you want to convert as a swap device. WARNING: all data on selected partition will be lost ! Choose 'swap' and press the button 'Format'. Swap devices are automatically recognized by Linux at boot time, even if you have not saved configuration. In section 'Swap files', click the button "New swap file". 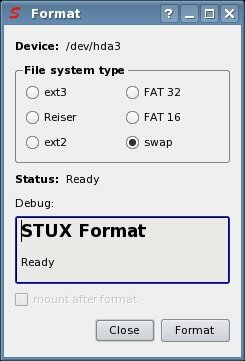 Swap files created with the STUX DEVICES tool are automatically reconfigured by STUX at boot time, but only if configuration is persistently saved or if swap file is called 'swapfile' and is saved in the root directory of a fat/ext2 partition. Right click with mouse in the 'Disk/swap partition' tab. Choose 'Direct Memory Access (D.M.A.)' from the pop up menu. The DMA tool will start. The DMA tool turns on/off DMA acceleration (direct memory access) for various IDE peripherals. This can speed up access and throughput of data up to factor 5, which is, for example, good for playing multimedia files without interruptions. CAUTION: There are very few computer boards around which have a defective DMA controller. On these boards, enabling DMA can lead to errors when reading data. In the worst case, data can be lost when writing to the device with DMA enabled.